How do I open the messages in Google Drive? Why does it keep crashing? Where is the collection on my phone? How can I save messages on the SD card? When will you display emoji? Why does it ask for permission to send messages? Questions that don’t appear here? Write to help@legaltextcollector.com. Sometimes messages can go missing because the sender is marked as a spam number, but missing messages usually result from carrier customizations that Text Collector can’t read. Check whether your cell provider is on the list of carriers with known problems. Sometimes there are workarounds that will allow Text Collector to access the messages. Other times, you may need to look into alternatives, such as screenshots. The current price $2 US. Google Play calculates the exchange rate if you’re not in the United States and might add sales tax, so you’ll see the final local price at checkout. This purchase unlocks the “sharing” feature; that lets you share as many collections as you like and use Text Collector on all your phones, so long as they all use the same Google account. Share a collection; if it’s your first time sharing, Text Collector will prompt you to purchase. 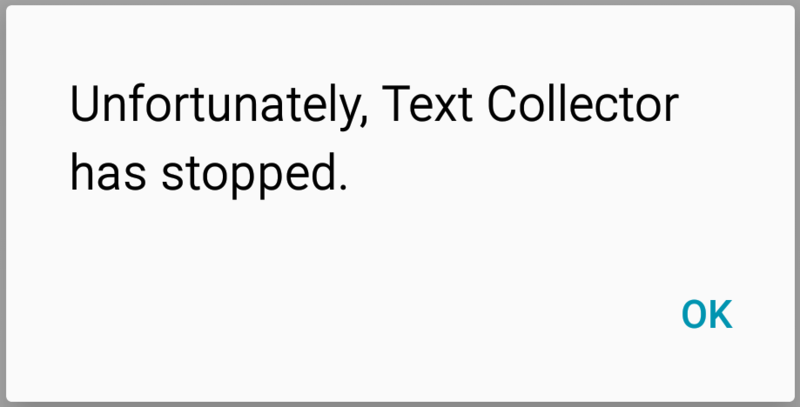 On Android 5 and earlier, you may see the “Unfortunately Text Collector has stopped” dialog. Usually this is caused by bug in Android itself – segfaults in the PDF generator. Google fixed this in recent Android versions, but didn’t deploy the fix to earlier versions. The phone may give you an option to report the error; please do report it, but Google gives me no way for me to reply. If you want a reply, please write help@legaltextcollector.com. Protected storage means that other apps can’t read it; if they could, apps not authorized to read your messages would be able to get to them. This also means, however, that you can’t directly copy it off the phone without root. To export a collection off the phone, use the share feature. Remember you can share with yourself. If you don’t care about keeping messages in protected storage and you want to copy them off the phone without using cloud storage, you can use the share feature to save them in “external storage.” External storage is where Android lets you copy files by connecting to an ordinary computer over USB. It may or may not be an SD card, depending on whether you have one installed. Showing emoji in printable text messages requires entirely replacing the stock Android PDF library and dealing with complicated non-portable color fonts. That will take a long time. Similar issues limit Text Collector to display only Latin-based scripts. Despite what this dialog says, Text Collection never sends messages. Apple does not allow third-party apps to access text messages, so an app like Text Collector cannot be made for iPhone. Software that extracts iPhone text messages usually accesses them via an iCloud backup. See Alternatives to Text Collector.